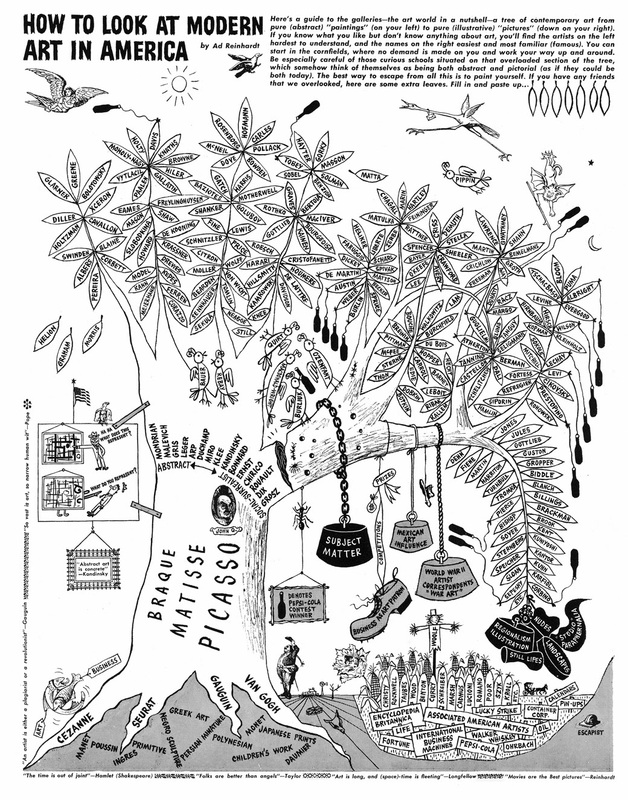 There's a big Ad Reinhardt show not at a museum, but at the David Zwirmer Gallery. And it looks fantastic, as you can see from the Robert Storr guided tour above. 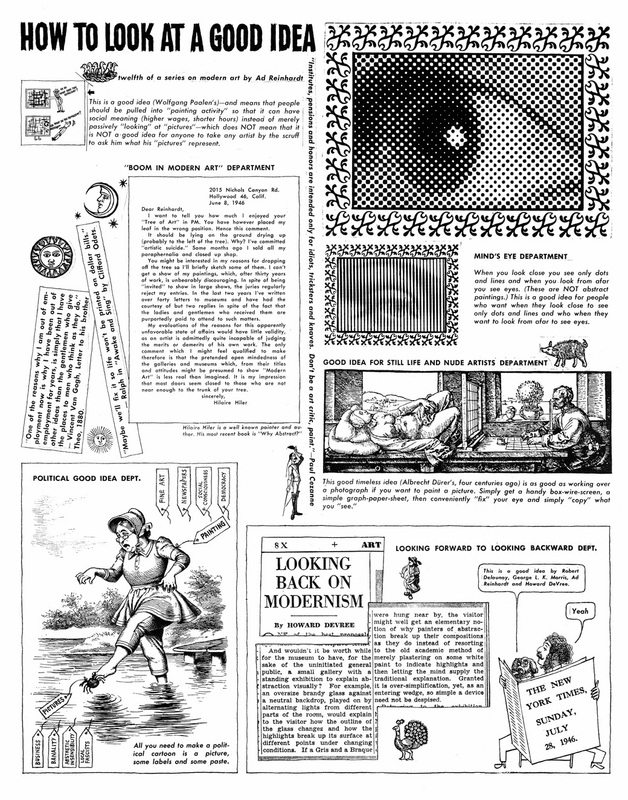 I wish I could see it, but I have ordered the accompanying book How to Look: Ad Reinhardt Art Comics with text by Storr. I might have more to say about Reinhardt after I read the book, but I wanted to show a couple of his cartoons. All of these are from "The Semi-Secret History of Modernism's Best Comic Artist" by Robin Cembalist from this month's ARTnews. (George Herriman is unquestionably Modernism's best comics artist, but that little disagreement is no reason not to read the article.) Reinhardt, it turns out, was a really good cartoonist, but he often avoided drawing and used collage. As the article states, "The master of the iconic, reductive Black Paintings was a virtuoso of white-out fluid, paste-up, and Photostats." The funny thing is that Reinhardt seemed like such a puritan when it came to painting. He had a theory, expressed in such gnomic tautologies as "Art is art-as-art. Everything else is everything else", that lead inexorably towards his own highly reductive paintings. And at the same time, he had this wacky side to him as a professional cartoonist. This is perhaps his best known cartoon. He did two versions of it--this one from ARTnews in 1961, and an earlier one for the left wing daily newspaper P.M. (where he worked) in 1946. Storr points out how many of the names are pretty much unfamiliar to us now. I always find that to be true when I look at old art magazines. I think there is a class of curators who pour through those old magazines to see if there is anyone who's reputation can be rehabilitated. This text-heavy piece was part of his "how to look" series, which ran mostly in P.M. (P.M. deserves its own book--Theodore Geisel (better known as Dr. Seuss) did some 400 cartoons for them and Crocket Johnson's Barnaby debuted there. ) And Reinhardt didn't just do cartoons about art--he also did lots of political cartoons. He reconciled the severe minimalist painter and theoretician of art side of himself with the wacky (but intellectual) cartoonist side, I'm not sure. All I know is that if you knew him just by his funereal black paintings, you would never guess that he had also authored hundreds of cartoons.